Freight rates for the nine-tonne payload section rose by Rs 1,000 at the local truck transport market in the national capital today following tight position of trucks coupled with better cargo movements. Transporters said tight availability of trucks and increased cargo movements mainly pushed up freight rates. 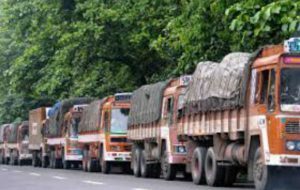 Delhi to Pune, Bengaluru and Gwalior freight rates moved up by Rs 1,000 each to Rs 29,000, Rs 62,000 and Rs 12,000. Rates to Vijayawada, Coimbatore and Kochi also enquired higher by Rs 1,000 each to Rs 60,000, Rs 69,000 and Rs 73,000. Elsewhere, rest other centres freight rates maintained overnight levels on some support. Following are today’s freights per 9-tonne load (in Rs): Jaipur 14,000 Hyderabad 56,000 Chandigarh 16,000 Vijayawada 60,000 Ludhiana 18,000 Bengaluru 62,000 Kanpur 19,000 Chennai 63,000 Indore 21,000 Mysore 64,000 Ahmedabad 20,000 Puducherry 66,000 Baroda 23,000 Coimbatore 69,000 Patna 25,000 Kochi 73,000 Surat 26,000 Thiruvananthapuram 80,000 Mumbai 28,000 Goa 59,000 Pune 29,000 Gwalior 12,000 Kolkata 30,000 Guwahati 60,000.